State Department spokeswoman says reports that former British PM is leaving Quartet are "incorrect". 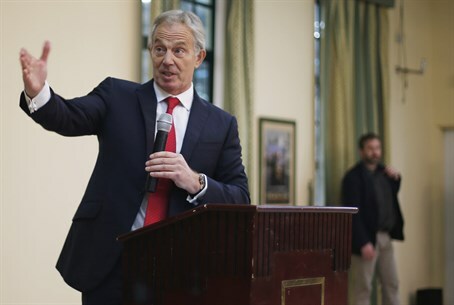 Washington denied Monday there had been any move to push Tony Blair out of his role as envoy to the Middle East Quartet, as he appears poised to relinquish the post. Reports that the former British prime minister was leaving due to unease in Washington and Europe over his poor relations with the Palestinian Authority were "incorrect," said State Department spokeswoman Jen Psaki, according to the AFP news agency. "There has been no effort to push him out of his current role as Quartet representative," she told reporters. The Financial Times said Sunday that Blair was stepping down after eight years in the job, and was preparing to take up a new role which could be announced later in the week. While Psaki confirmed Blair had met with Secretary of State John Kerry in the Egyptian Red Sea resort of Sharm el-Sheikh over the weekend, she did not go into details of their discussion. Blair has been "a valued partner in the effort to bring peace to the Middle East. We'll continue to value his support," she said, according to AFP. The United States was "grateful for his service and efforts on his behalf of the Quartet for the past eight years," Psaki said. But she added, "This is a natural time to reflect on the way forward for the Middle East peace process and the role of the Quartet going forward." Blair was appointed to the unpaid position in 2007 by the informal body comprising the United Nations, United States, European Union and Russia, to lead efforts to support the Palestinian economy and institutions in preparation for eventual statehood. However, peace efforts have stalled and borne no fruit. Writing on his website last month after visiting Gaza, Blair said, "The present state of Gaza is a rebuke: to those of us in the international community who over the years have made so many promises unfulfilled; to those who have offered leadership and failed to provide it." The move comes amid some reflection on the role of the Quartet, set up in 2002, given that peace efforts remain frozen and it has been seen as largely ineffective. New EU foreign policy chief Federica Mogherini has been calling for the Quartet to be expanded to include other countries such as Arab nations. The group has been mostly silent over the past year as it let Kerry try to broker a deal between the sides. Kerry’s efforts ultimately failed when the PA torpedoed talks by requesting to join 15 international agencies in breach of the conditions of the negotiations.